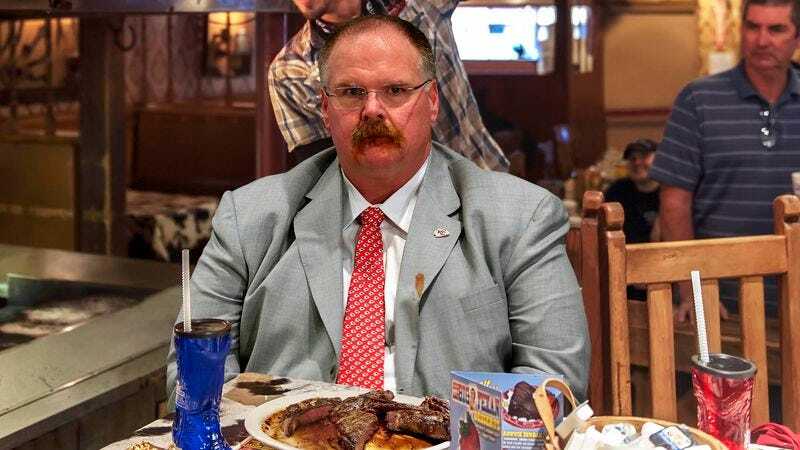 KANSAS CITY, MO—Lamenting his total lack of urgency while chewing, Kansas City Chiefs head coach Andy Reid expressed frustration with himself Thursday over his poor clock management in the final moments of Union Grill’s 72-ounce “Belt Buster” steak challenge. “I just lost track of the clock, and the next thing I knew, there was only one minute left and still 15 ounces of steak to go,” said Reid, bemoaning the fact that he leisurely dipped every piece of the 4.5-pound sirloin in A.1. Sauce while precious seconds continued running off the clock. “Once I realized how little time was left, I tried to hurry up and managed to get most of it down, but I had trouble lining up the next chunk. I always say how important it is to eat with all your heart for the full 60 minutes, and don’t look ahead to the next meal, and days like today show why. But there’s no one to blame but myself.” Reid added that to avoid a similar mistake in the future, he is simply going to eat the entire steak in a single mouthful.